Hello, my name is Darrell DiZoglio. 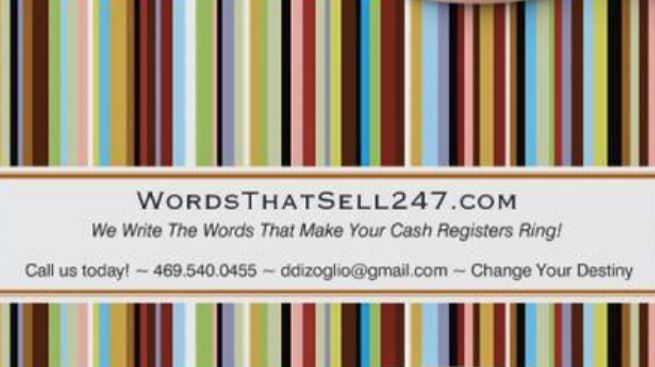 I am a Sales, Advertising and Marketing Writer/Writing Expert (aka Copywriter) with 27 years experience selling to consumers and businesses. Unlike a regular writer, veteran Copywriters focus on the words that sell and actually produce results. After 27 years of experience, research and study, I can assure you I know what works. What really delights me professionally though, is hearing back from my clients who have received sales results in abundance. Thus, my clients gave me the High Performance Copywriter title. I use many time-tested and proven techniques in my powerful sales writing that sells for you 24 hours a day and 7 days a week. but to buy now so they can have them. Two-Tone Submariner watches are definitely not for everyone, only the lucky few. prospect feeling as if they will lose out if they fail to purchase right now. action they want to take. "Shark" at the beach in Miami, Florida. That's a trigger phrase. funds during the first sales presentation/effort. I use my expertise, research, consumer psychology, competitive intelligence and 25 years of trade secrets, many gained from experience listening to client feedback on various advertising/marketing campaigns. I strive to continuously improve. My clients consistently say I generate excellent results. Thanks to them, I am one of the busiest and most recommended professionals on Linkedin today (please order/set appointments in advance of need if possible).